What do you get when you ask Jamie Oliver to make you tea? Jamie Oliver - Who could not fall in love with this guy's relaxed and cool cooking style? And who could not fall in love with how he drizzles "a tiny bit" i.e. the whole bottle of olive oil to make a small serving authentic Italian Pizza. God I love this guy! Jokes aside, he is one of the greatest cooks I truly admire. So when my colleagues were organizing a work lunch at Jamie's Italian, I was ecstatic. Jamie's has a strict booking policy. They only accept bookings for groups over 6. Wait time on the phone to make a booking = 30 mins (Vodafone customer service, I love you from now on! ), and wait time to get in without a booking = close to 2 hours! Yup, that is how insanely popular this restaurant is. Luckily were were 6 from the office and we got a reservation. 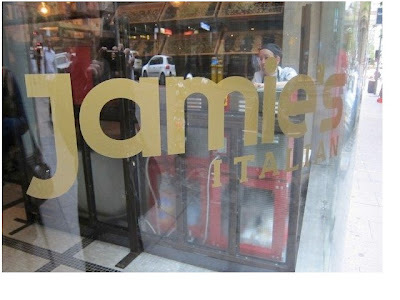 The ambiance at Jamie's is true to Jamie Oliver's cooking style - relaxed and rustic. No fancy lights, no funky tables/chairs - nothing glamorous. The focus is here is just on food. And now about food itself: The menu at Jamie's is quite extensive. BUT, its not quite extensive for vegetarians. Seeing how many vegetarian dishes Jamie Oliver incorporates in his shows and cookbooks, I was quite surprised by the few vegetarian options the menu had. While the starters had a few options, the mains were heavily meat based - not one vegetarian dish. So as our entrees made way to our table, I am already salivating....to take a picture of the food! (As I got my phone out, my colleagues gave me a dirty stare which translated into "you're not one of those people that take pictures of food - are you?" Me: "Yeah, I am a proud food-stagramer" Nice try - fail, Vidya! We ordered Tomato Bruschetta, Roasted peppers on chick pea flat bread and salt and pepper squid. Bam! The Bruschetta was truly the best bruschetta I've had. The rightly toast bread was layered with silky ricotta cheese, fresh & sweet cherry tomato halves and the just the right amount of basil drizzled with olive oil. The absolutely divinity lasted in my mouth for less than 2 minutes! For $10 a plate (2 Bruschettas) it was well worth it. The roasted peppers was fine - while it dint excite me like the Bruschetta, it wasn't bad either. 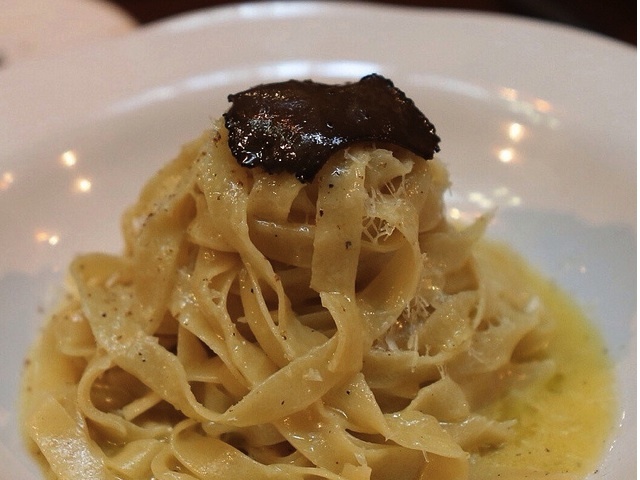 For mains, I chose the Truffle Tagliatelle - which is essentially Burnt butter pasta with shaved truffles and Parmesan. i.e. the right amount of carbs and fat in the form of 2 heart attacks packed in one lunch. My colleagues picked their choices and one by one the orders started come in. The Veal Saltimbocca ordered by my colleague was severed on a wooden plate, garnished masterchef style. And finally came my Truffle Pasta - and was just out of the world! Hey, how could something drenched in butter and cheese possibly taste bad! The smell of butter and the melting of parmesan cheese on the hot pasta was just uh, phenomenal. Carbs, fat, calories - who gives a damn! It was absolutely amazing. Oh how I love gluttony! I ate the butter pasta almost till my nose that I had no place for dessert (both in my stomach or wallet). Shame! My final verdict: I read a few reviews online before going and the reviews were quite mixed so I warned myself not to get my hopes to high. Would I go again - absolutely! 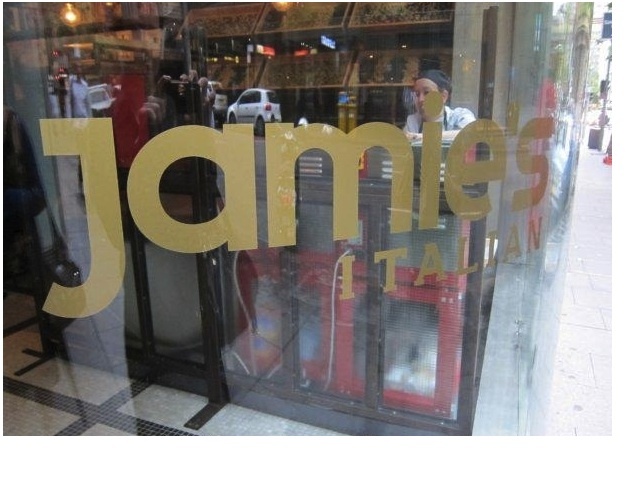 Although the Vegetarian choice quite limited, Jamie's is a great place for a group of friends who love Italian food in a relaxed environment. And of course, you can show off to others and have something interesting to talk about your exciting weekend when you meet your colleague at the water fountain. Service: British backpackers who couldn't find a job - Not the world's friendliest staff. PS: On a less lofty note, I also realised that eating the butter & cheese covered pasta 2 hours before my Bikram Yoga class doesn't always work well.